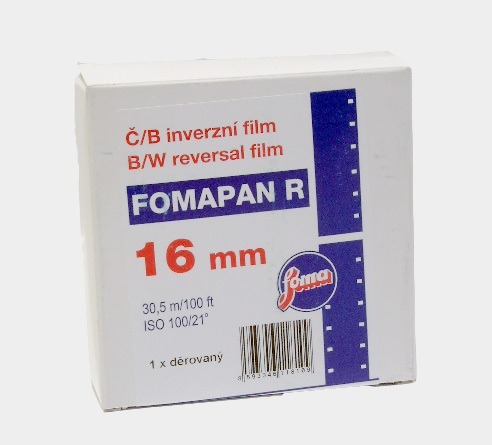 FOMAPAN R 100 is a medium sensitive (ISO 100/21), panchromatically sensitized black-and-white reversal film featuring very fine grain, high resolving power and contour sharpness, and higher contrast. The film provides excellent differentiation of grey tones both in highlighted areas and in shadows. Spectral sensitization of FomapanR allows true transfer of colours to the grey scale, and in addition, enables full speed exploitation even at artificial lighting. The film is designed for work with cine-camera. Conventional processing is also possible. The film can be used for digitization. Film is produced on a cellulose triacetate safety film base of thickness 0,125 mm when high mechanical and dimensional stability and high life expectancy is required. Chemistry can be ordered here .